The Republican budget hero provides a clear context and contrast to a race where there previously was little. So it’s now official: Republican presidential hopeful Mitt Romney has a running mate. Last weekend Team Mittens announced the selection of Wisconsin Congressman and House Budget Committee Chair Paul Ryan as Romney’s #2. You could almost hear the champagne corks popping in Chicago. The selection of Ryan, the principal author of the official Republican budget proposal, entitled “The Path to Prosperity,” changes this presidential election in a very substantial way; it defines it in a way that it had not been defined before. Romney wanted to make this election exclusively about President Barack Obama’s handling of the national economy, a dubious tack to begin with for a number of reasons that need not be spelled out here other than to say that deliberate and systematic Republican obstructionism has played a starring role in the slow pace of economic recovery. But now, with Ryan officially on the ticket, this election becomes a clear and unmistakable choice about who and what we are as a country. Are we a country of the 1%, by the 1%, for the 1%? Or are we a country whose prospects rest on the health and strength of the middle class, as it was from the post World War II era until the 1980’s, when supply side/trickle down/“voodoo” economics became the national religion? Regardless of what Mitt Romney says about his support for the Paul Ryan budget plan—he was for it long before he decided he was against it last weekend, telling Talking Points Memo that “anyone who has read my book knows that (Ryan and I) are on the same page”—the damage is already done. He can change his mind and run away from the official Republican budget plan all he wants, but his choice of Paul Ryan as running mate tells the voting public otherwise. And the blatant flip-flops are not going over well. As Nate Silver of the NY Times’ Fivethrityeight blog notes, the period of time in the immediate aftermath of a vice presidential announcement is usually a high watermark for a campaign. See: McCain-Palin. And while it’s still very early, the most recent polling results that have measured opinions on Ryan’s inclusion have not exactly been stellar. “More often than not, the candidate’s unfavorable numbers increase more than his or her favorable from that point forward,” Silver writes. Ryan’s favorable numbers, according to Silver’s analysis, currently sit at 38% (up from 23% previous to the announcement), with his unfavorable weighing in at a steady 33%. Mitt Romney and his constantly fluid positions on everything from the Ryan budget to abortion and birth control are not gaining him any ground in this election. And his choice of Paul Ryan is unlikely to change that. Ryan is an exceedingly popular figure in far right Republican circles. He is sure to solidify Romney’s position with the Republican base. But he is very unlikely to help Team Mittens make any headway with the swing voters who will decide the election. Here are some of the choices that voters are going to have to make this coming November: Does the country focus on growing the economy from the middle class out, which has historically proven to be best way to guarantee economic growth, or do we continue to institute policies that place the focus on the already uber wealthy in hopes that their good fortunes “trickle down” to the rest of us? To we continue to configure our tax policies to favor the rich and cut taxes even more from already historic lows, or do we ask the already exceptionally well off to contribute a little bit more while giving middle class wage earners a bit of a break? 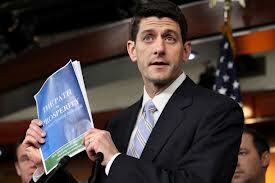 Do we take Romney and Ryan at their word when they say that their budget proposals will reduce the deficit, or do we accept CBO and other independent analyses that have found that both Romney and Ryan would explode the budget deficit and national debt? And here’s the really big one: Do we turn Medicare into a voucher program and ask the next generation of seniors to pay nearly $7,000 more per year for their health care needs than they otherwise would have to, nearly doubling the out of pocket costs for those over 65? Team Mittens wants us to take it on faith that although independent analysts have determined that the claims in both the Ryan budget and the Romney tax plan are mathematically impossible, their plans will increase government revenues because rich people will be doing so well in growing the economy. Ever since the Reagan era that’s been the religious doctrine of the Republican Party. The most prosperous economy in the last 30 years came under Bill Clinton’s Democratic administration, when he raised taxes to a top marginal rate of 39% for the highest tax brackets. The economy grew exponentially, and experienced the first budget surplus in recent history. Along came George W. Bush, who decided that that would just not do. He proceeded to cut taxes drastically—twice. 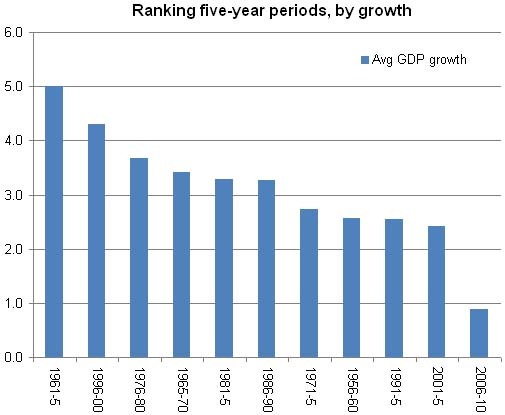 According to the NY Times Economix blog, the result was a “decade with the slowest annual economic growth since World War II.” In other words, the Bush tax cuts that were touted as the vehicle for unbelievable economic growth failed to deliver on those promises—tax cuts that overwhelmingly favored the already wealthy. 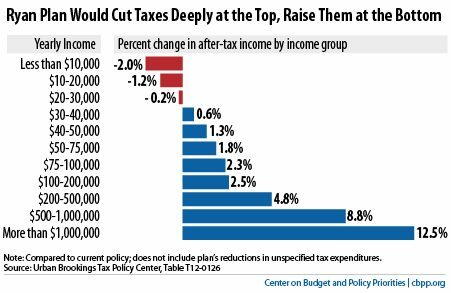 Obama by contrast is asking those already well off to contribute a little more, while extending the Bush tax cuts for those making less than $200,000 per year. The working—and proven—theory is that by bolstering the middle class, more people will have more money to spend, and spend it they will. And when the middle class is doing well, everybody benefits, including the rich, and the economy grows. This is not theory. This is time proven and tested fact. Meanwhile, Mitt Romney wants those same people to pay an extra $2,000 per year while giving his rich friends (and himself) a huge tax break. But perhaps the single most important factor that will decide this upcoming election is the divergent plans that Romney/Ryan have for Medicare and Medicaid, as opposed to what the Obama administration has already put in place. As already mentioned, Ryan’s budget (aka: The official Republican Party budget plan) turns Medicare into a voucher program (they call it “premium support,” but vouchers are vouchers, no matter how you spin it) that will not only increase medical costs, but significantly increase out of pocket costs for Medicare recipients. And if their plan to kill “Obamacare” comes to fruition, they would eliminate health care coverage to the more than 30 million Americans who are slated to receive said coverage only because of the provisions in the Affordable Care Act. Neither Ryan nor Romney have any designs on how remedy that. But what Ryan does to Medicaid is even more devastating: Under Ryan’s plan, 30 million Americans will lose access to health care because of Ryan’s cuts to Medicaid by 2020. That’s on top of the 30 million who will be denied access should Republicans get their way in dismantling the Affordable Care Act. Sixty million people. All without health care because of Mitt Romney and Paul Ryan. So are we a country that builds its economy from the middle out, allowing the rich to get richer in the process, but at the same time creating a comfortable lifestyle for the overwhelming majority? Or are we a country of the elite, for the elite, by the elite, where the rich get richer and the middle class withers? That’s the stark choice we are offered this November that has been made crystal clear with the addition of Paul Ryan to the Republican ticket. And Mitt Romney can no longer simply run on mischaracterizing Obama’s record on the economy. He has now clearly staked out his positions for all to see. President Obama, with a complete lack of political courage, failed to follow through on his own bipartisan budget commission headed by Alan Simpson and Erskine Bowles. Bowles, President Clinton’s chief economic advisor (remember Clinton? a balanced budget?) has recent praised Paul Ryan’s budget leadership. The tax break arguments are reflected in the Federal Reserve’s policy of inserting money into the economy at the top. Just as Romney-Ryan want to give tax breaks to the rich, the Fed loans money at zero interest to the big banks, i.e. the rich. To build a robust middle class, there should be interest free loans to the middle class; the money should be inserted at the bottom, not at the top. An interest free loan is the same as giving the money because why would you ever have to pay it back? Job creation by the wealthy is nil whether money is given to them via tax breaks or via interest free loans. Money given to the poor and middle class will get spent in the real economy and not immediately funneled into the casino economy. Taxing the poor and giving tax breaks to the wealthy is nothing new. Ryan’s fellow Ayn Rand acolyte, Alan Greenspan, was a past master at this. His trick was to rapidly increase social security or payroll taxes while reducing income taxes. The net effect was an overall regressive tax on the poor while the rich got a huge tax break. The self-employed really get screwed since they have to pay both the employee’s and the employer’s share. They end up paying more in FICA taxes than the capital gains tax the rich pay which is 15%.